California voters are divided on whether they believe local officials should help, hinder or stay out of the way when federal ICE agents go after those accused of minor offenses, according to a SurveyUSA poll conducted for Eyewitness News. 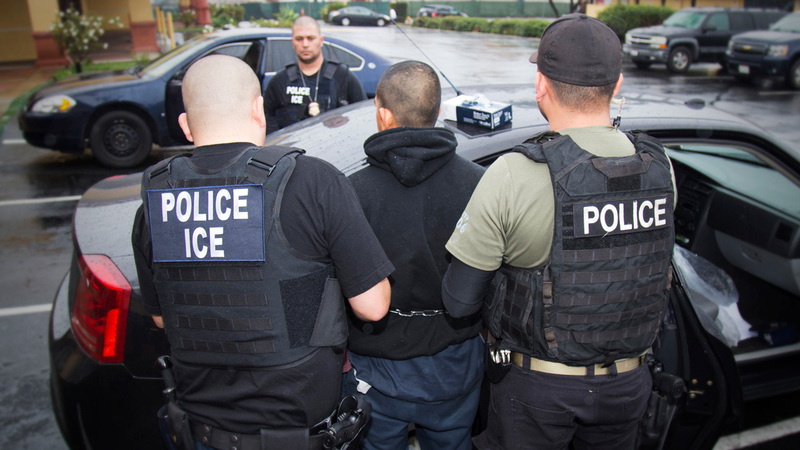 Poll results show that when it comes to U.S. Immigration and Customs Enforcement officials taking custody of immigrants accused of violent crimes, a majority statewide (54 percent) say that local officials should work to help ICE. Just 11 percent said local California officials should try to stop ICE in such circumstances, and 24 percent said local officials should stay out of the way. Voters are much more divided in cases when ICE agents are trying to arrest immigrants for non-violent crimes. According to poll results, 29 percent said local officials should help ICE, with Republicans four times more likely as Democrats to say so. Results also show that 25 percent said local officials should try to stop ICE, with liberal voters four times as likely as conservative voters to say so. Lastly, 34 percent said local officials should stay out of the way. Similar results were seen in cases where ICE agents go after immigrants accused of immigration violations only. - 11% say it's one of the nation's top priorities. - 14% say it's a high priority. - 14% say it's a priority. - 19% say it's not a priority. - 40% say it's a distraction. Separately, voters by 5:1 are opposed to a section of Northern California cleaving off from the rest of the state, becoming America's 51st state, and taking the name of Jefferson. Republicans, conservatives, men and young people are slightly more likely to favor cutting the state in half, but majorities across the demographic spectrum oppose the publicized plan. "Should officials in California who become aware that Immigration Customs and Enforcement agents are about to take immigrants into custody actively work to help ICE do so ... actively work to stop ICE from doing do ... or stay out of the way...in each of the following situations? When ICE arrests immigrants accused of violent crimes?" "When ICE arrests immigrants accused of minor non-violent crimes?" "When ICE arrests immigrants accused of only immigration violations?" "President Trump came to California to look at prototypes of the kind of border walls that Trump wants to erect between the United States and Mexico. Is building a wall between the United States and Mexico..."
"Should California secede from the United States and become its own country? Or, should California remain a state in the union?" "Whether or not California should secede from the United States, should the Northern, rural part of California secede from the state of California and become its own state, with the proposed name of Jefferson? Or should the northern, rural part of California remain part of California?" SurveyUSA interviewed 882 registered voters March 22, 2018 through March 25, 2018. A larger group, 1,100 adults, were asked questions about whether California should secede from the union and whether a section of Northern California should split off and become the state of Jefferson.